Tout-Fait brings together international scholars and writers from art and science backgrounds and many other fields of study. 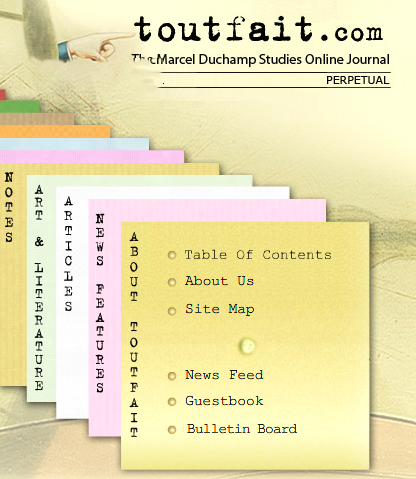 An interdisciplinary project, Tout-Fait is committed to presenting a variety of news features, articles, interviews, and short notes relating to Duchamp, one of modern art’s most important figures, and his circle of contemporaries. Without the restrictions of the print media, Tout-Fait presents an expanded field for art and science writers, permitting a fluidity of thought as well as form, while generating a dialogue among established thinkers, young scholars and the interested public. Tout-Fait’s appearance has received worldwide attention in the fields of art history and humanities, with a four-year visitor count of 200,000, and growing. Tout-Fait has become an intellectual asset with historical value for the study of modern art and culture. Its Internet presence also has proven indispensable, with its free accessibility and scholarly excellence. 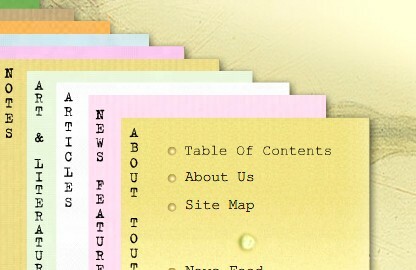 Beginning in 2005, Tout-Fait has transformed into a perpetual publication; the site will be updated constantly, with each new peer-reviewed and accepted submission, as well as with newly equipped features, such as extensive Search, posted Comments, daily News Headlines, and a virtual Auditorium. A strictly not-for-profit journal, Tout-Fait is made possible by a team effort of writers, editors, programmers and web designers. The continuation of Tout-Fait relies upon the commitment of our readers and the kind support of contributors.